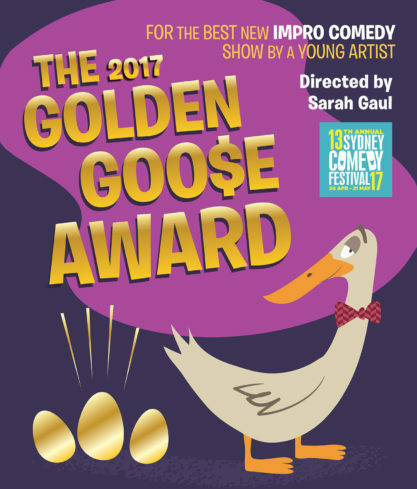 Golden Goose Award Finalists Announced! CONGRATULATIONS to all the teams that played last night at the Golden Goose Heats at Harold Park!! It was a stellar show with a massive turnout and 6 incredible brand new formats! Thanks to the guys at Harold Park Hotel for having us, as well as our muso Max Volfneuk and our esteemed judged Laura Hart, Maddie Parker and Jack Ballhausen. It was a tight finish, but we are thrilled to announce that ON THE ROCKS (Maddie Houlbrook-Walk, Reuben Ward, John Robles), SURPRISE ENDING ( Jeromaia Giuseppe Detto, Chloe Lethlean Higson, Emilia Higgs) and A HOLIDAYS CAROL (Davis Murphy, Alexander Richmond, Issy Phillips, Tom Waddell) are through to The Golden Goose Award at the Sydney Comedy Festival! See the teams battle it out on Sunday the 30th April at 4.30pm at The Factory Theatre as part of the Sydney Comedy Festival. Get your tickets before they sell out!